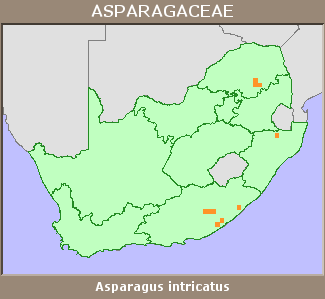 A. intricatus has a disjunct distribution between the Eastern Cape and KwaZulu-Natal and Sekhukhuneland. The Sekhukhune plants are likely a different species that is threatened, but the new revision of this genus has not yet been completed and the taxonomic problems not yet resolved. Komga to northern KwaZulu-Natal and Sekhukhuneland, Limpopo Province.